Odaiba was a short trip my friends and I made during our last few hours in Tokyo because it was only a train ride away. This was actually my second time coming here because the first time was with my family during the summer. I realize that winter is their low season so there are not many people around and it is very quiet. Several stores and restaurants may be closed, especially the ones at the Decks Tokyo Beach (or at least when I went) but you can still go up on the deck to enjoy the view. Odaiba is a very colorful place at night because the ferris wheel, bridge, and attractions within stores light up. 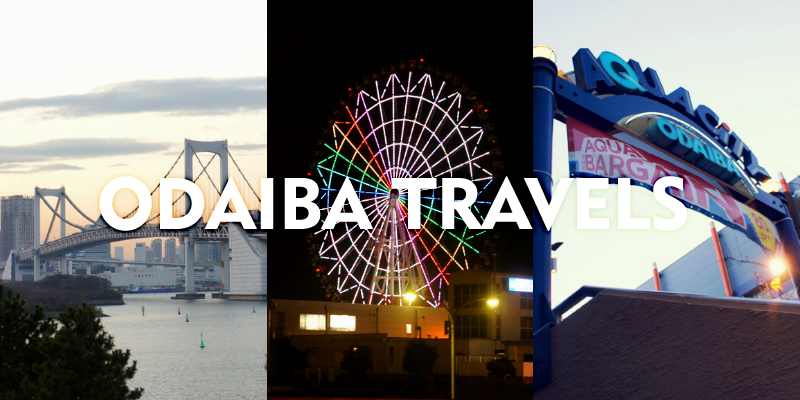 I suggest heading to Odaiba when the weather is warmer because other than it being more lively and more stores open, they also have more events such as the Tokyo Bay Grand Fireworks Festival in August. During the festival, many young couples and friends would have picnics by the river and watch for the fireworks display. My friends and I stayed for dinner with the view of the river and Rainbow Bridge. Everything is mostly walking distance from each other so there is no need to public transportation once you're in the area. → A man-made island just a bridge away from central Tokyo. → Train: The Rinkai Line will give you direct access to Odaiba where you can get off at Tokyo Teleport Station. Before you travel to Japan, you can buy a JR Rail Pass at JRPass.com (available for purchase for $279 in the US, not available to Japanese residents) that will be shipped to your home via FedEx. This may save you a lot of money if you plan to travel via train several times in Japan (can also be used in the subway for JR lines). At the airport, there is a JR Pass service area where you show them your pass you received in the mail and they will give you the actual official pass that is stamped for you to use whenever you ride the train. The option I chose was a 7-consecutive day pass with unlimited usage within the 7 days, beginning the first day you use it in order to travel from city to city in Japan. Prior to boarding a train, seat reservation is available but not required. Just show your official pass at the gate and then you are free to board a train. Destinations and train times are listed on the monitors above you in the station, but be aware that there are faster and slower trains. The JR Rail Pass can also cover your subway transportation if you are using a JR Line; just ask at the gate. If you are ever lost, just ask an attendant as most are very helpful even with little English. → Odaiba has many places to eat within the shopping malls of Venus Fort, Aquacity, and Decks Tokyo Beach. Prices may vary. → There are a large selection of stores in Venus Fort, Aquacity, and DiverCity Tokyo Plaza. → If you are looking for amusement, you can ride the Ferris Wheel, visit the Madame Tussauds wax museum, and play at games for hours at a multi-level arcade in Leisureland. You can check their websites for more information and pricing if you are interested. Right outside the Tokyo Teleport Station. View of the Rainbow Bridge at the Decks Tokyo Beach. The Ferris Wheel at night (changes colors).